Now decades of ivy has been cut carefully off the wall and piled high in the front garden, ready for several bonfires, I can see the damage to the wall. And in fact, the ivy is only the half of it. In one place, the wall has developed curvature of the spine, curling over at the top so that it’s about 12 inches off vertical. It leans so badly that individual stones are being squeezed out and they hang, poised, ready to drop. The reason? In the dim and distant past, the next door neighbours thought it would be nice to have an espalier pear. Fine in principle, but years and years of not being pruned allowed it to just grow up, lean against the wall and grow towards the light in my garden. 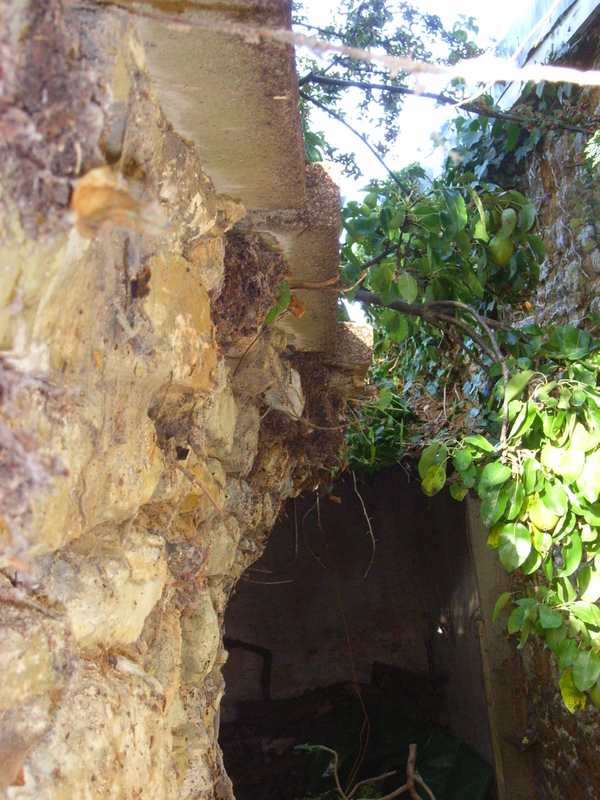 The pear tree is pushing the wall over and is going to have to go. Will the absentee landlord play ball? Ownership of the wall is in doubt, but it may well be mine: my cottage dates to 1750, next door to 1911. But unless the pear tree goes, the wall can’t be fixed. In the picture, the damaged wall is on the left, and the wall on the right is the back of my shed, destined to be an art studio one day. In the 4 foot space between it and the boundary wall is the old outside lavatory.